On the occasion of Vigilance Awareness Week (30th Oct – 4th Nov.), celebrated by Central Vigilance Commission, a speech competition was organised at Him International School. 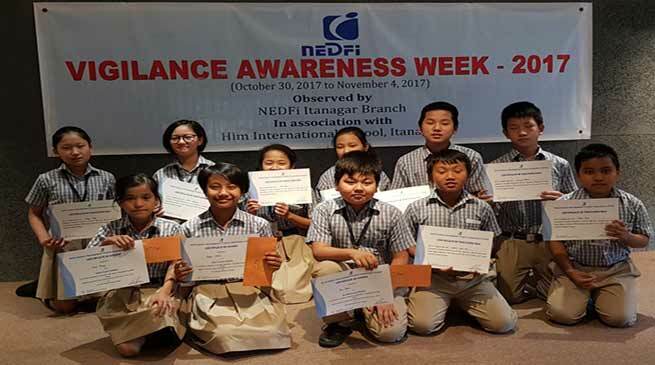 It was proposed by North Eastern Development Finance Corporation Limited (NEDFi) and the topic was on this year Theme “My Vision- Corruption Free India”. The 1st Prizes went to Bengia Cathriene, 2nd Place to Tana Dopum and 3rd Place to Joram Mercy. They got cash prize as well as Merit Certificate. Him International School, Jully Academic Head Satish Chandra Dubey, and Senior Officer Boa Mali, were the judges for the competition. NEDFi. Branch Manager Alen Nabam, Boa Mali and Principal Rajendra Singh Parihar, gave away the cash prize and the merit certificates. All the participants were present a certificate of appreciation. It was an excellent opportunity for the students to share their views and get guidance from the honourable guests. The entire atmosphere was informative, entertaining and vibrant which actually helped in creating awareness about the corruption.